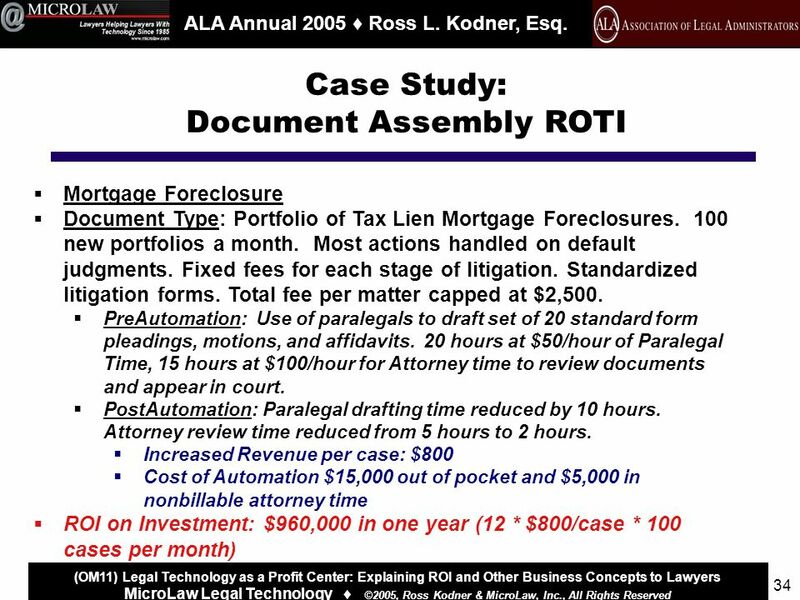 New York LegalTech February 2004 ALA Annual 2005 Ross L. Kodner, Esq. 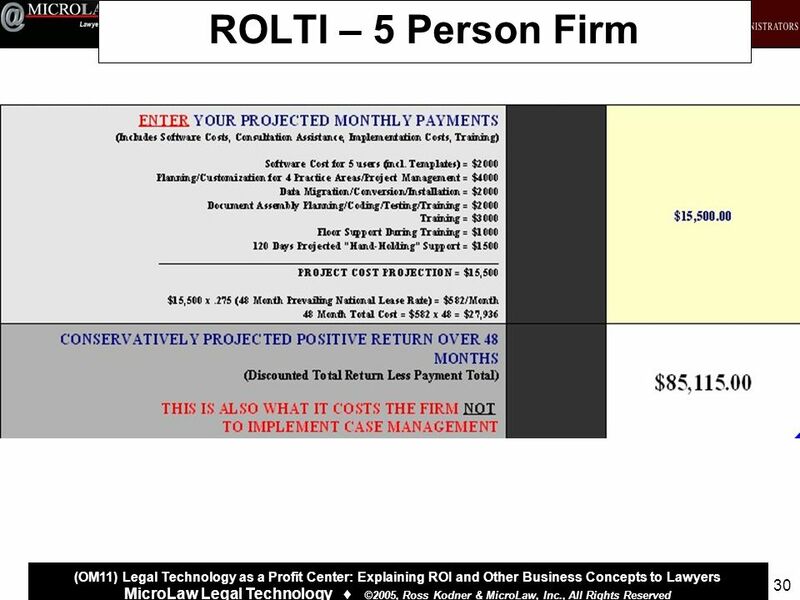 (OM11) Legal Technology as a Profit Center: Explaining ROI and Other Business Concepts. 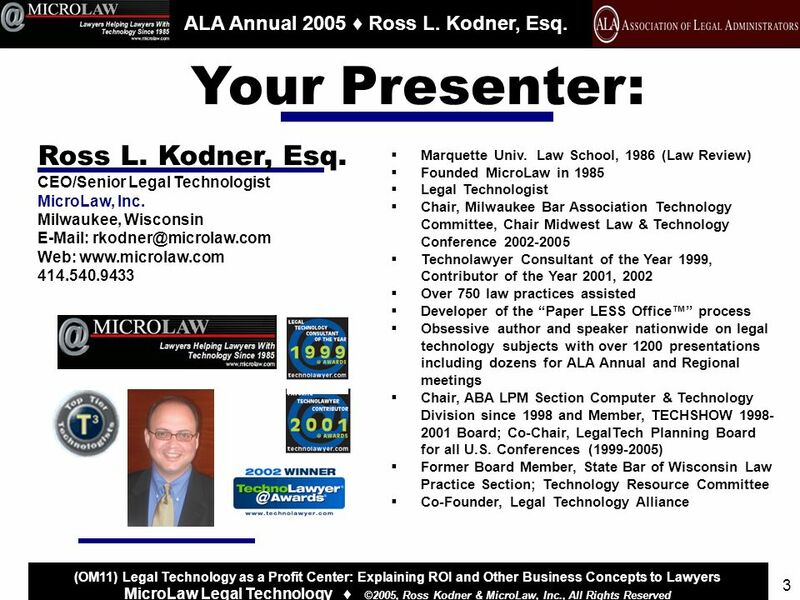 2 New York LegalTech February 2004 ALA Annual 2005 Ross L. Kodner, Esq. 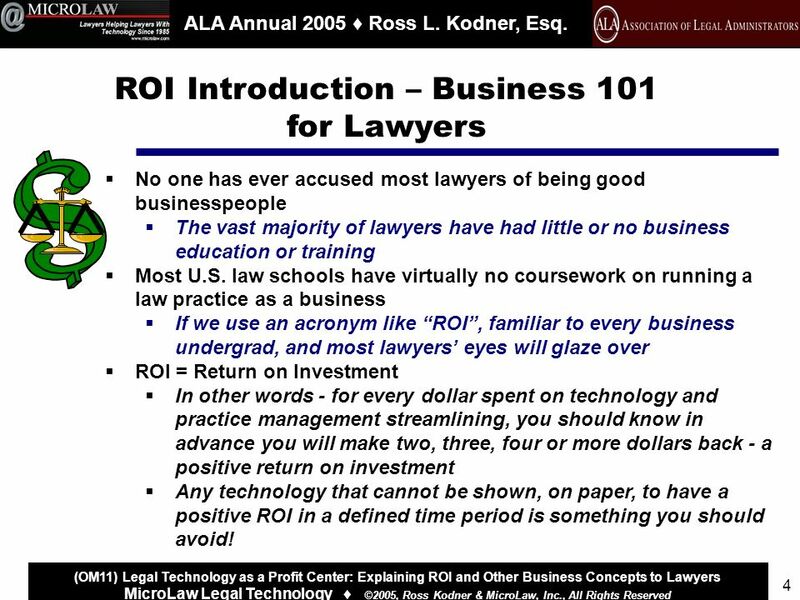 (OM11) Legal Technology as a Profit Center: Explaining ROI and Other Business Concepts to Lawyers MicroLaw Legal Technology ©2005, Ross Kodner & MicroLaw, Inc., All Rights Reserved 2 These materials will be available online at: www.microlaw.com Look for the ALA Annual 2005 links! 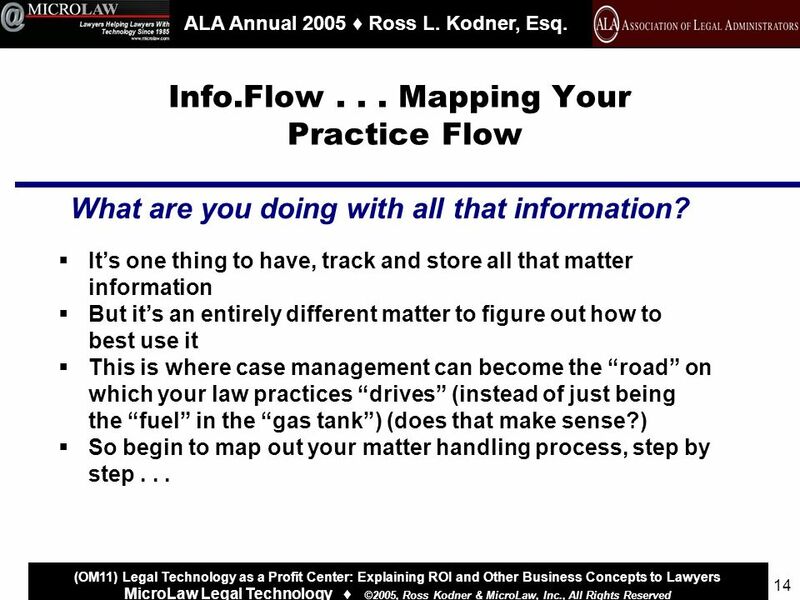 4 New York LegalTech February 2004 ALA Annual 2005 Ross L. Kodner, Esq. 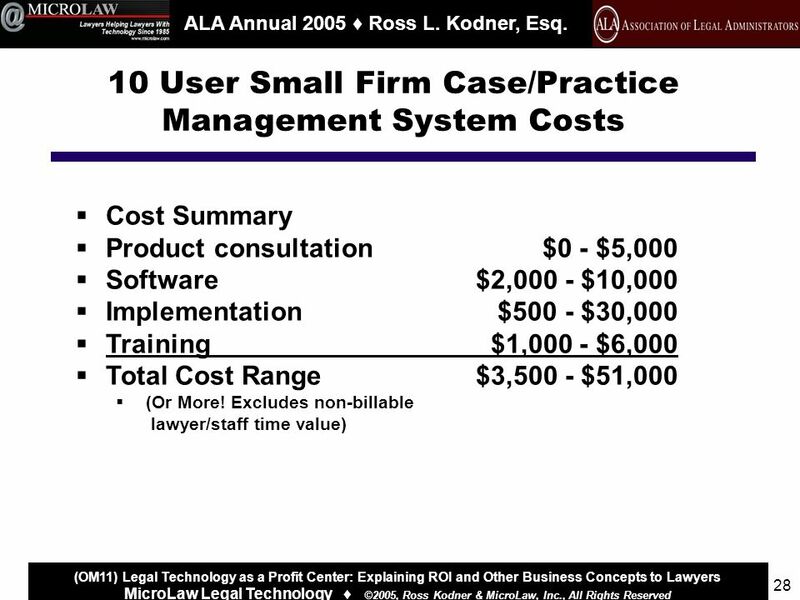 (OM11) Legal Technology as a Profit Center: Explaining ROI and Other Business Concepts to Lawyers MicroLaw Legal Technology ©2005, Ross Kodner & MicroLaw, Inc., All Rights Reserved 4 ROI Introduction – Business 101 for Lawyers No one has ever accused most lawyers of being good businesspeople The vast majority of lawyers have had little or no business education or training Most U.S. law schools have virtually no coursework on running a law practice as a business If we use an acronym like ROI, familiar to every business undergrad, and most lawyers eyes will glaze over ROI = Return on Investment In other words - for every dollar spent on technology and practice management streamlining, you should know in advance you will make two, three, four or more dollars back - a positive return on investment Any technology that cannot be shown, on paper, to have a positive ROI in a defined time period is something you should avoid! 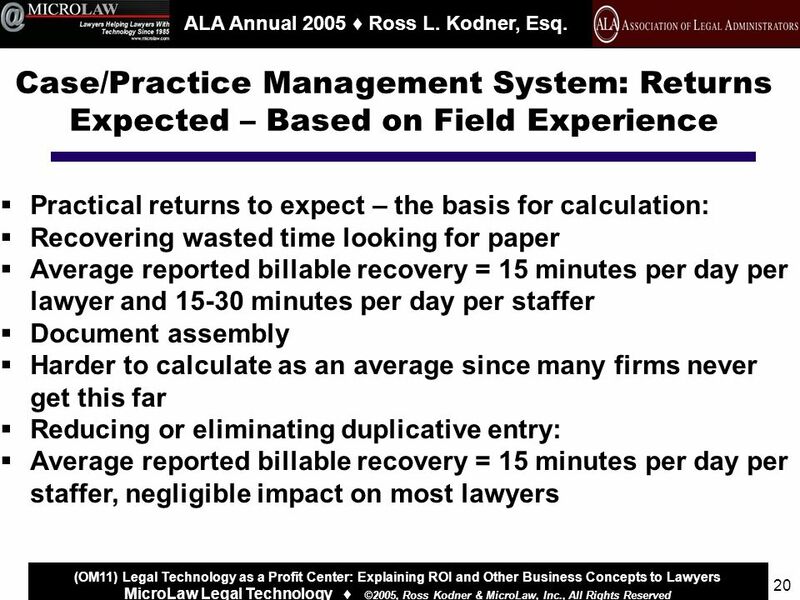 5 New York LegalTech February 2004 ALA Annual 2005 Ross L. Kodner, Esq. 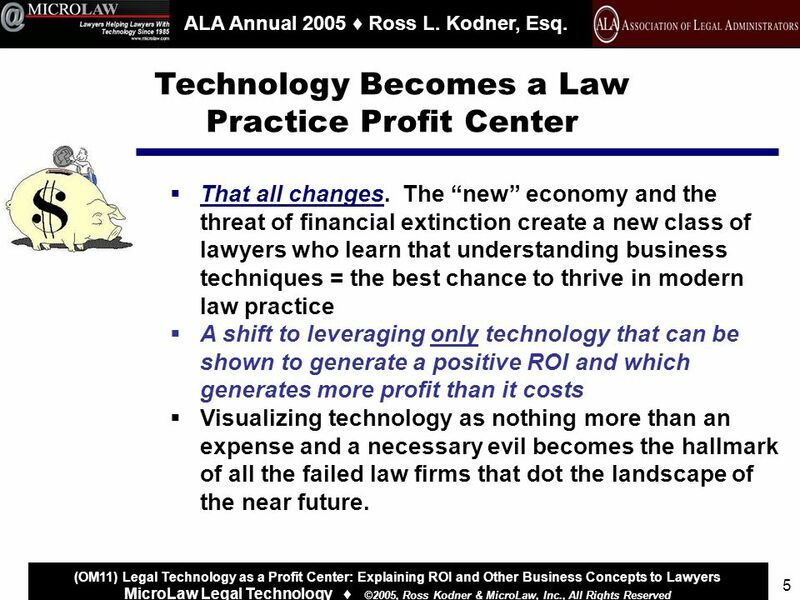 (OM11) Legal Technology as a Profit Center: Explaining ROI and Other Business Concepts to Lawyers MicroLaw Legal Technology ©2005, Ross Kodner & MicroLaw, Inc., All Rights Reserved 5 Technology Becomes a Law Practice Profit Center That all changes. The new economy and the threat of financial extinction create a new class of lawyers who learn that understanding business techniques = the best chance to thrive in modern law practice A shift to leveraging only technology that can be shown to generate a positive ROI and which generates more profit than it costs Visualizing technology as nothing more than an expense and a necessary evil becomes the hallmark of all the failed law firms that dot the landscape of the near future. 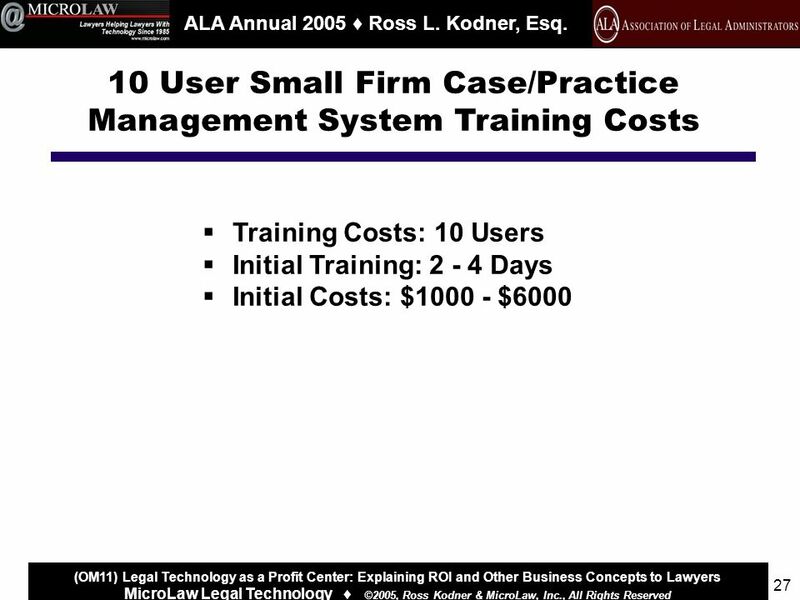 6 New York LegalTech February 2004 ALA Annual 2005 Ross L. Kodner, Esq. 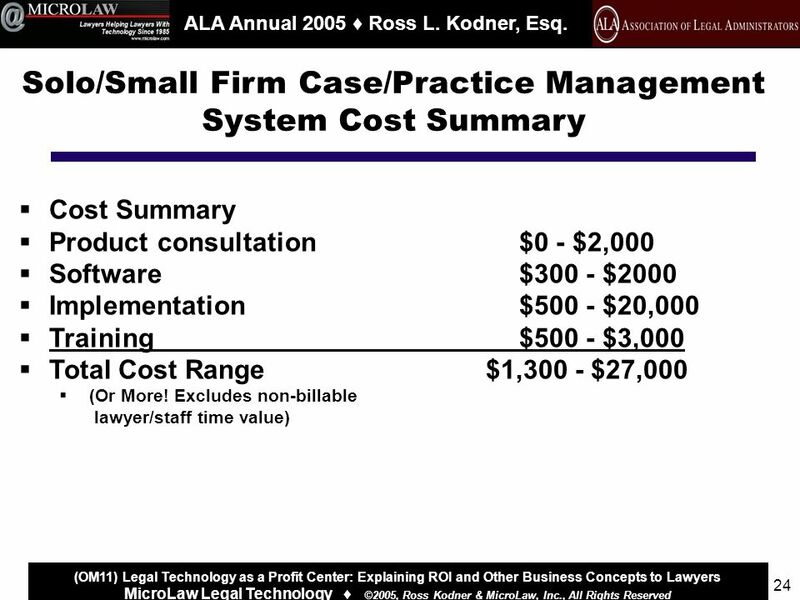 (OM11) Legal Technology as a Profit Center: Explaining ROI and Other Business Concepts to Lawyers MicroLaw Legal Technology ©2005, Ross Kodner & MicroLaw, Inc., All Rights Reserved 6 How Much Otherwise Billable Time Do You Waste Every Day? How much time do you spend/waste Looking or waiting for files? * 15 min * 30 min * 1 hr * 2 hr +? Trying to determine case status for clients? * 5 min * 15 min * 30 min * 1 hr +? Cutting and pasting or retyping documents * 15 min * 30 min * 1 hr * 2 hr * 3 hr +? Typing duplicate info into multiple programs? * 10 min * 30 min * 1 hr * 2 hr +? 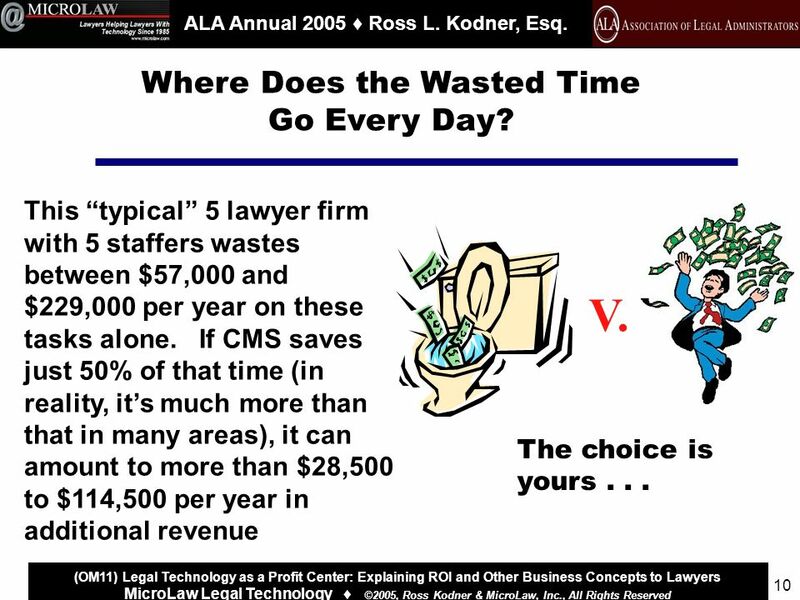 And dont forget - how much time does your STAFF waste on those same tasks? 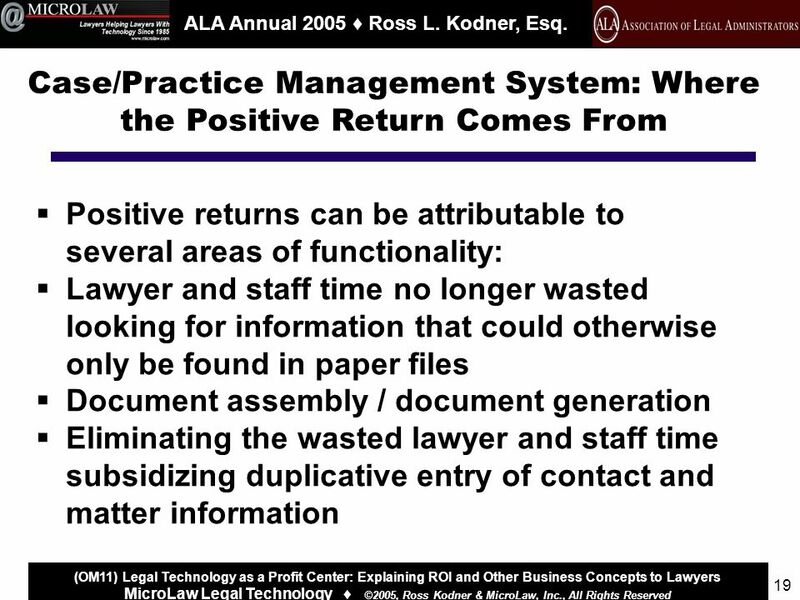 7 New York LegalTech February 2004 ALA Annual 2005 Ross L. Kodner, Esq. 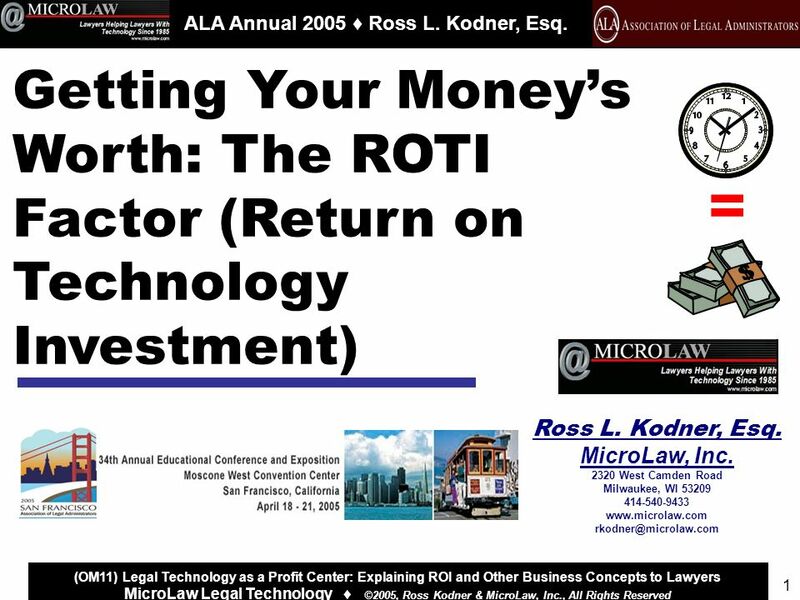 (OM11) Legal Technology as a Profit Center: Explaining ROI and Other Business Concepts to Lawyers MicroLaw Legal Technology ©2005, Ross Kodner & MicroLaw, Inc., All Rights Reserved 7 Where Does the Wasted Time Go Every Day? 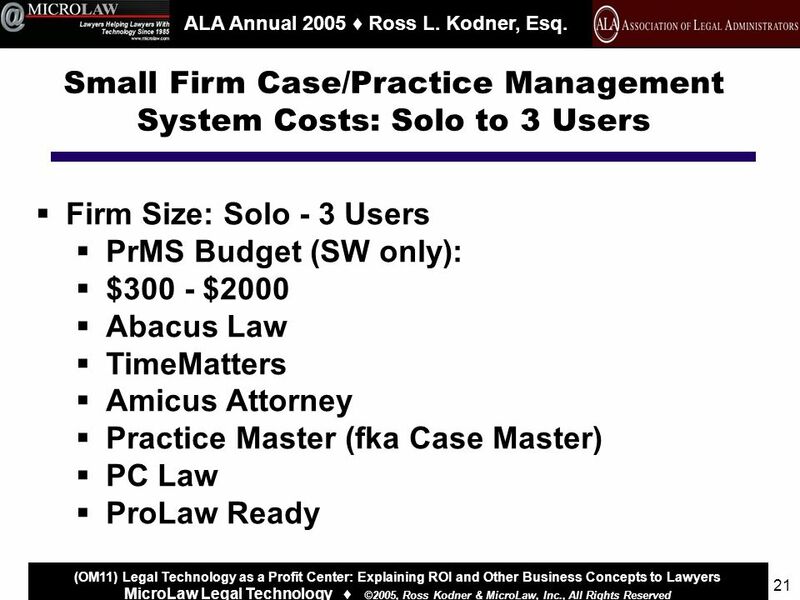 Assume: Small firm size of 5 attorneys, 5 staff, billable rate of $200 per hour for lawyers, cost of Staff time, $35 per hour Looking or waiting for files? * Attorney: 15 min, Staff: 30 min Trying to determine case status for clients? 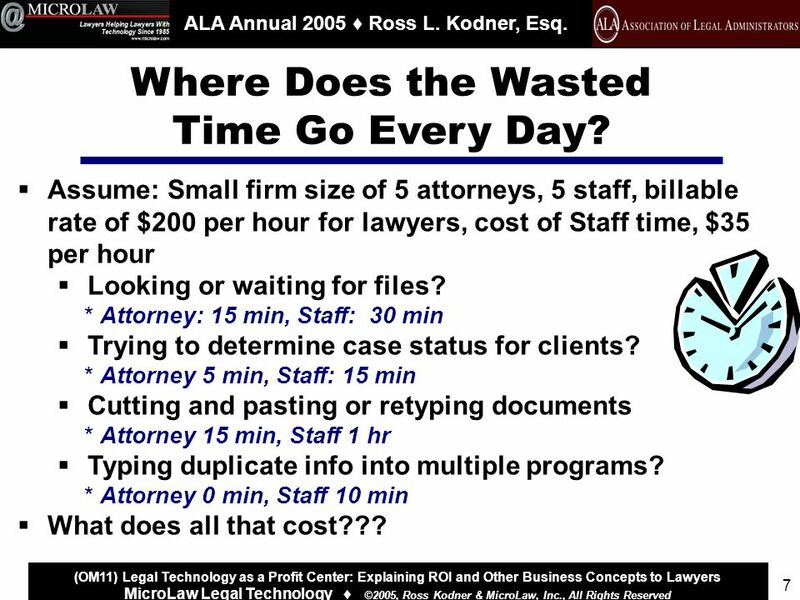 * Attorney 5 min, Staff: 15 min Cutting and pasting or retyping documents * Attorney 15 min, Staff 1 hr Typing duplicate info into multiple programs? 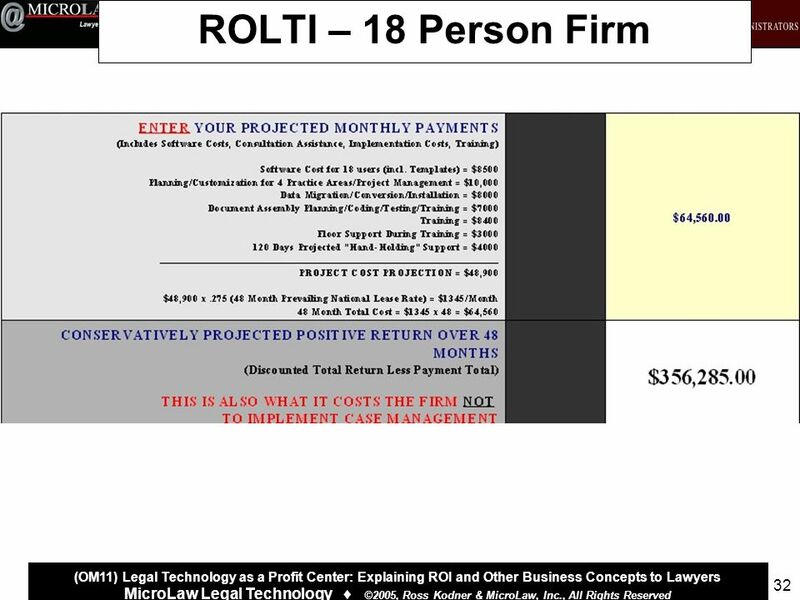 * Attorney 0 min, Staff 10 min What does all that cost??? 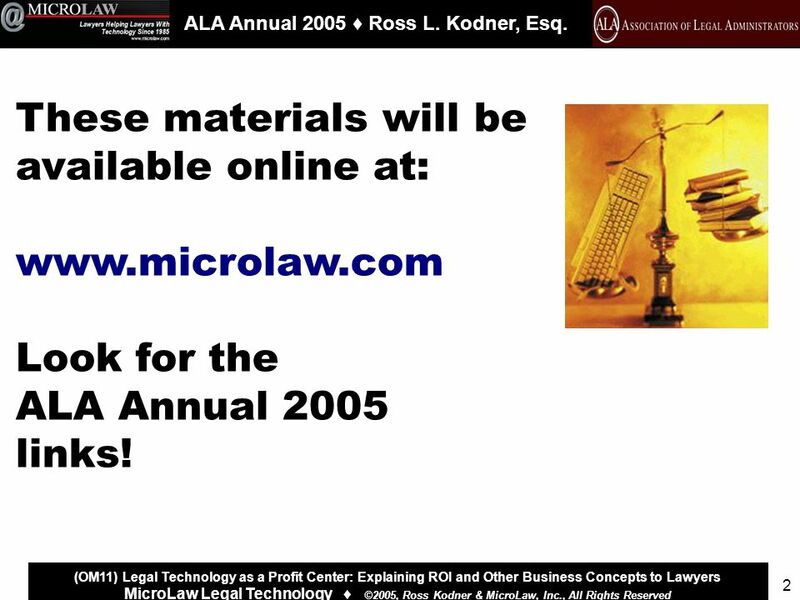 8 New York LegalTech February 2004 ALA Annual 2005 Ross L. Kodner, Esq. 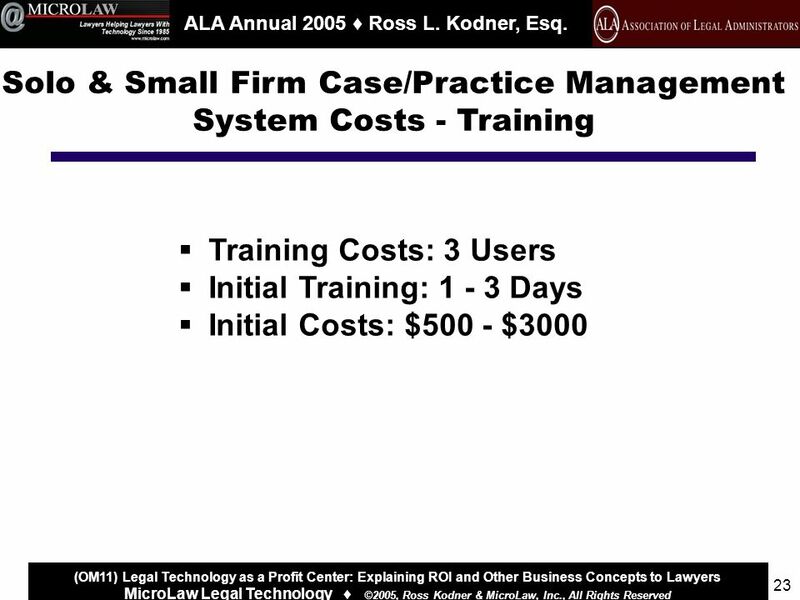 (OM11) Legal Technology as a Profit Center: Explaining ROI and Other Business Concepts to Lawyers MicroLaw Legal Technology ©2005, Ross Kodner & MicroLaw, Inc., All Rights Reserved 8 For 5 Lawyers / 5 Staffers - The Cost of Inefficiency is Staggering! 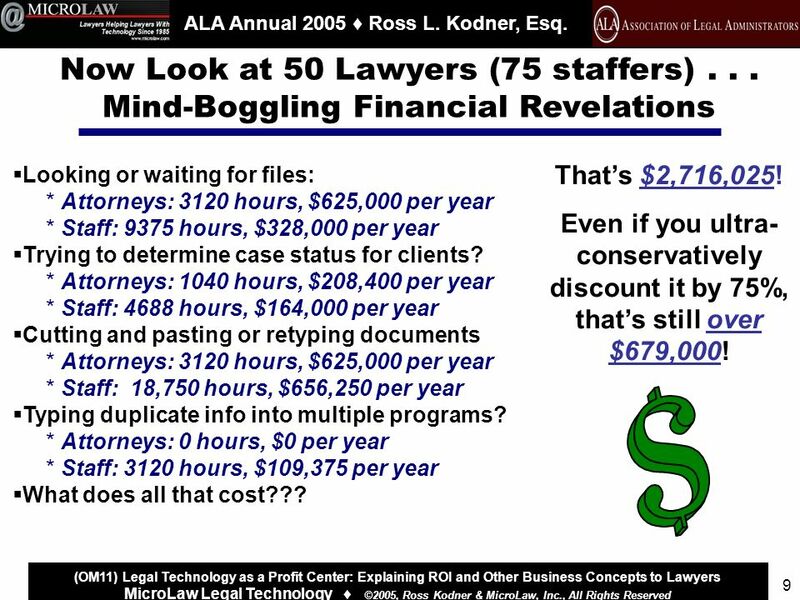 Looking or waiting for files: * Attorneys: 312 hours, $62,500 per year * Staff: 625 hours, $21,900 per year Trying to determine case status for clients? 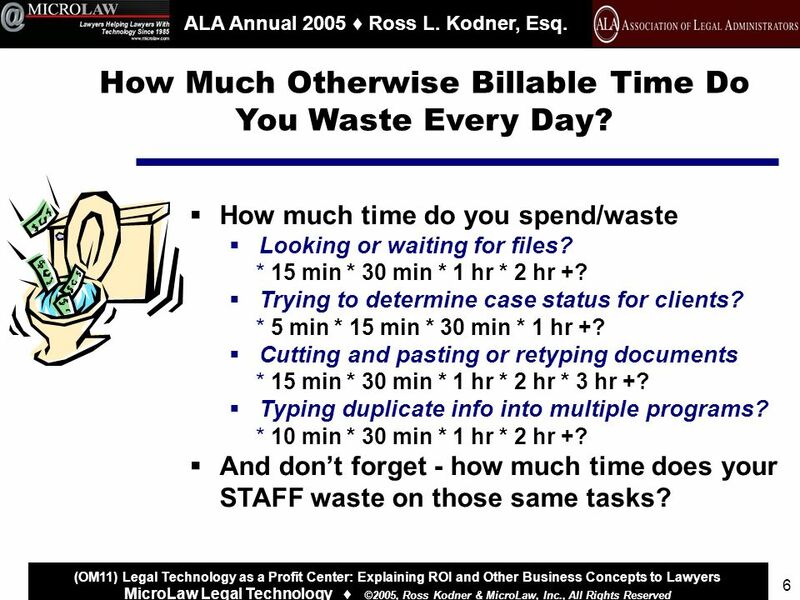 * Attorneys: 104 hours, $20,840 per year * Staff: 312 hours, $10,940 per year Cutting and pasting or retyping documents * Attorneys: 312 hours, $62,500 per year * Staff: 1250 hours, $43,750 per year Typing duplicate info into multiple programs? 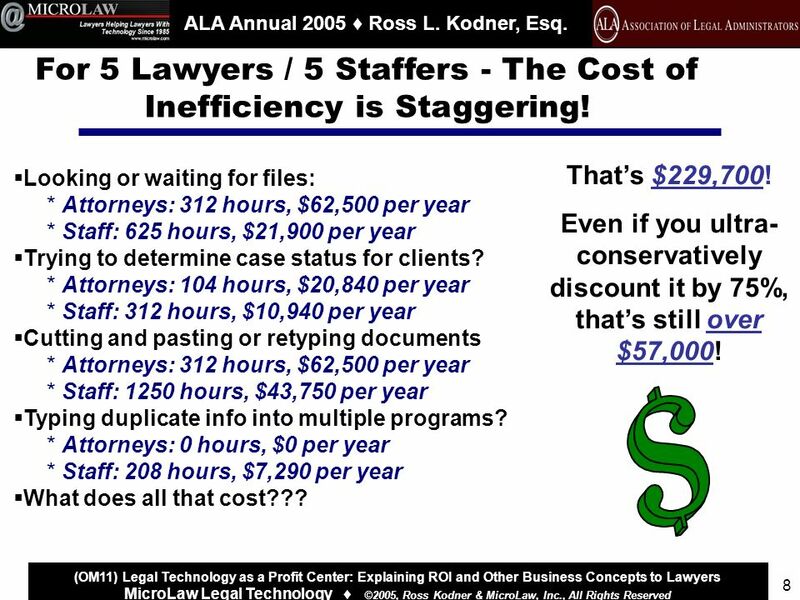 * Attorneys: 0 hours, $0 per year * Staff: 208 hours, $7,290 per year What does all that cost??? Thats $229,700! Even if you ultra- conservatively discount it by 75%, thats still over $57,000! 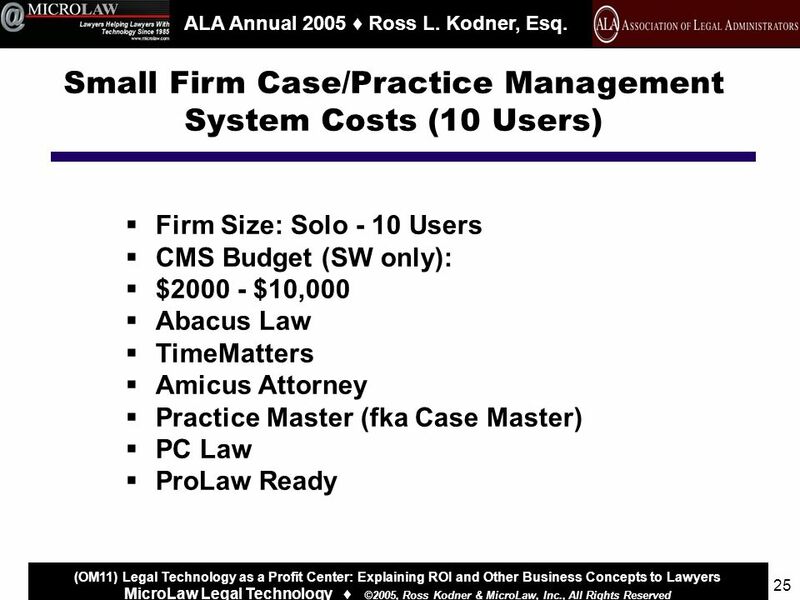 9 New York LegalTech February 2004 ALA Annual 2005 Ross L. Kodner, Esq. 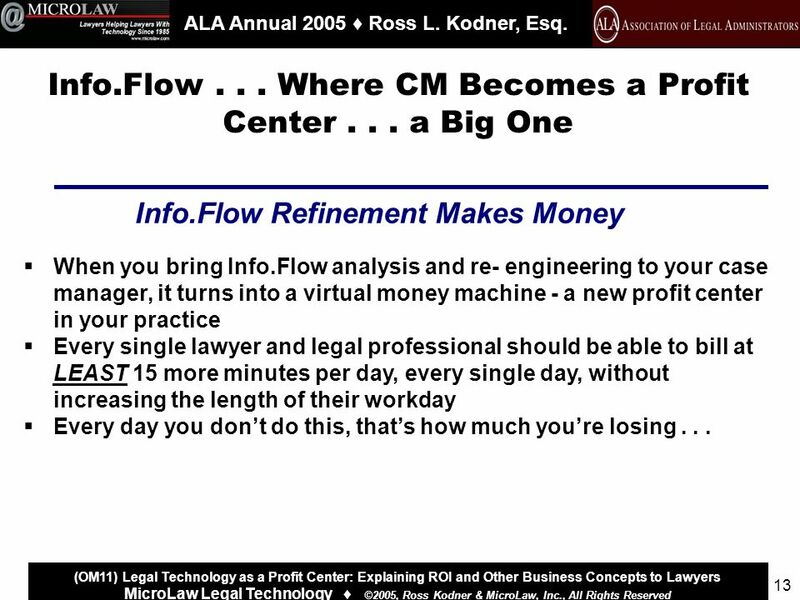 (OM11) Legal Technology as a Profit Center: Explaining ROI and Other Business Concepts to Lawyers MicroLaw Legal Technology ©2005, Ross Kodner & MicroLaw, Inc., All Rights Reserved 9 Now Look at 50 Lawyers (75 staffers)... Mind-Boggling Financial Revelations Looking or waiting for files: * Attorneys: 3120 hours, $625,000 per year * Staff: 9375 hours, $328,000 per year Trying to determine case status for clients? 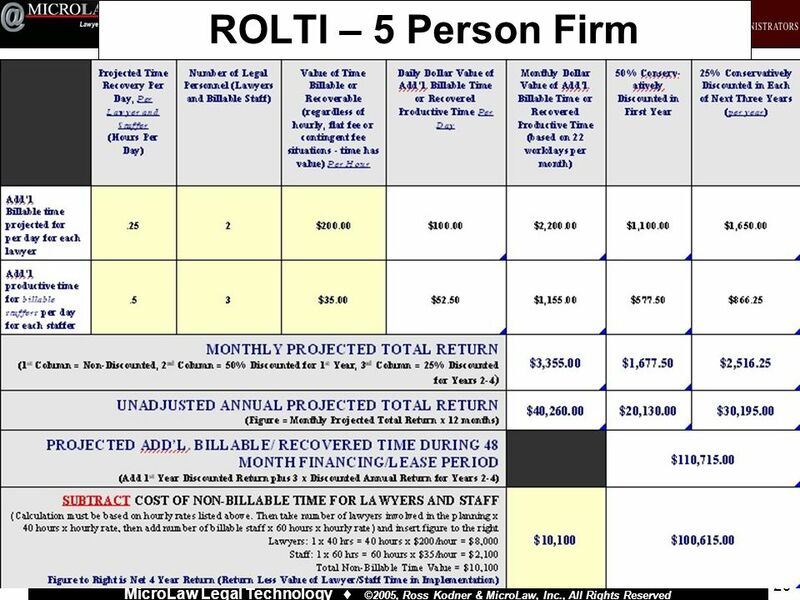 * Attorneys: 1040 hours, $208,400 per year * Staff: 4688 hours, $164,000 per year Cutting and pasting or retyping documents * Attorneys: 3120 hours, $625,000 per year * Staff: 18,750 hours, $656,250 per year Typing duplicate info into multiple programs? 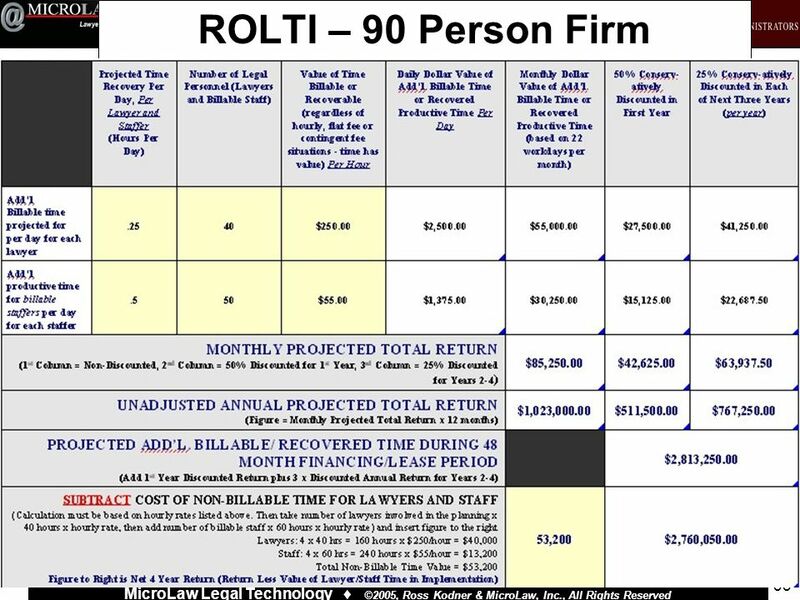 * Attorneys: 0 hours, $0 per year * Staff: 3120 hours, $109,375 per year What does all that cost??? Thats $2,716,025! Even if you ultra- conservatively discount it by 75%, thats still over $679,000! 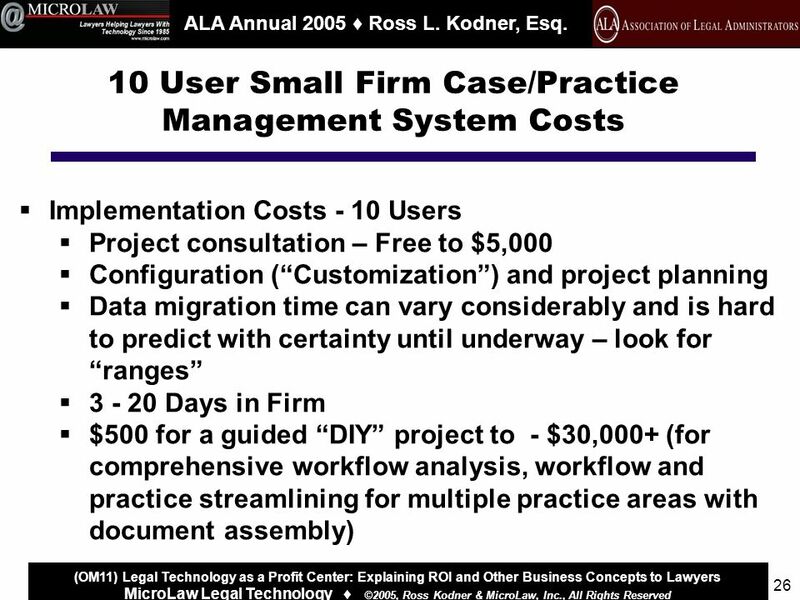 11 New York LegalTech February 2004 ALA Annual 2005 Ross L. Kodner, Esq. 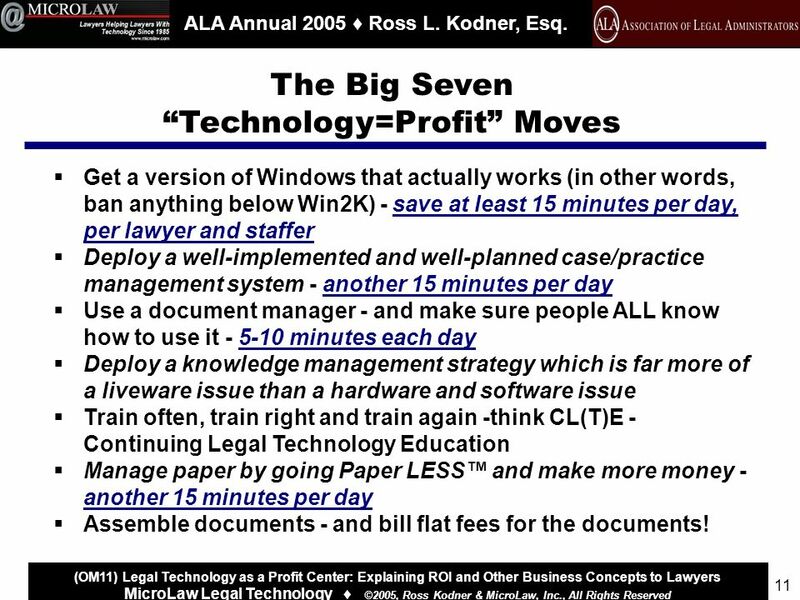 (OM11) Legal Technology as a Profit Center: Explaining ROI and Other Business Concepts to Lawyers MicroLaw Legal Technology ©2005, Ross Kodner & MicroLaw, Inc., All Rights Reserved 11 The Big Seven Technology=Profit Moves Legal technology moves that translate to fast ROI and become virtual money machines: Get a version of Windows that actually works (in other words, ban anything below Win2K) - save at least 15 minutes per day, per lawyer and staffer Deploy a well-implemented and well-planned case/practice management system - another 15 minutes per day Use a document manager - and make sure people ALL know how to use it - 5-10 minutes each day Deploy a knowledge management strategy which is far more of a liveware issue than a hardware and software issue Train often, train right and train again -think CL(T)E - Continuing Legal Technology Education Manage paper by going Paper LESS and make more money - another 15 minutes per day Assemble documents - and bill flat fees for the documents! 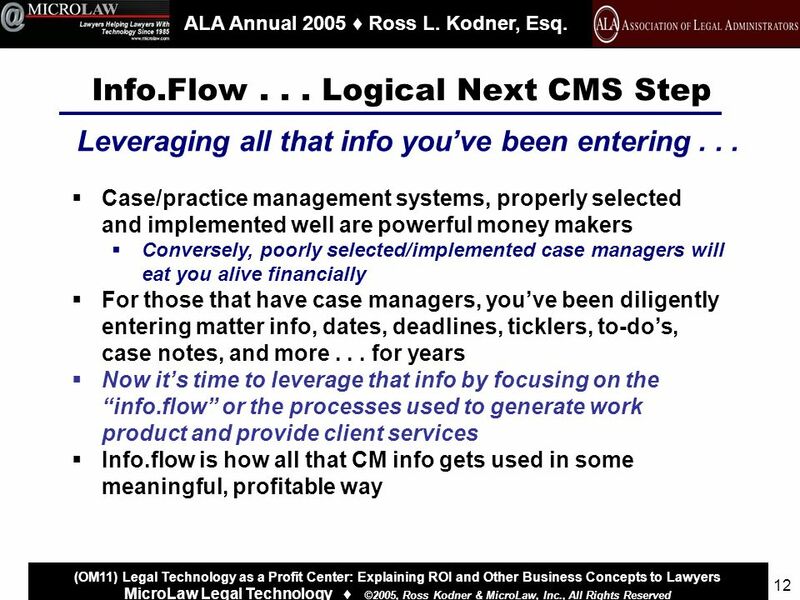 17 New York LegalTech February 2004 ALA Annual 2005 Ross L. Kodner, Esq. 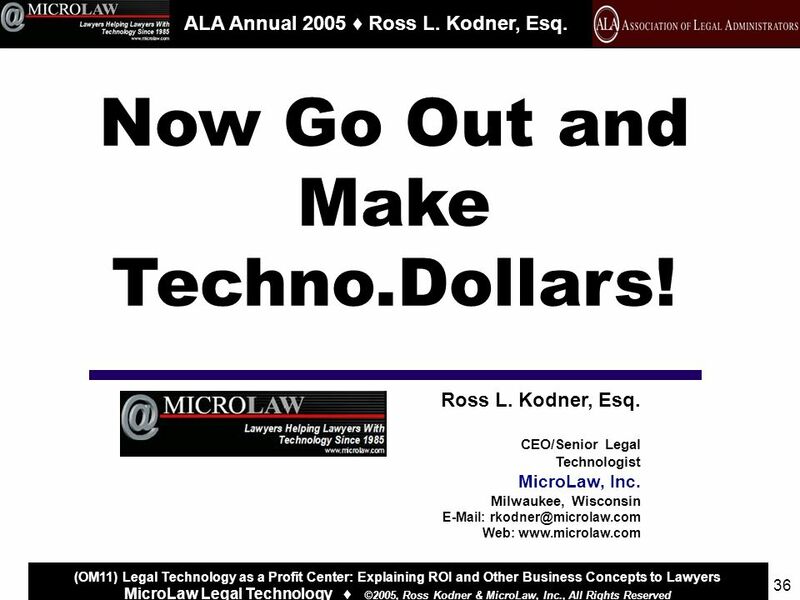 (OM11) Legal Technology as a Profit Center: Explaining ROI and Other Business Concepts to Lawyers MicroLaw Legal Technology ©2005, Ross Kodner & MicroLaw, Inc., All Rights Reserved 17 Info.Flow... 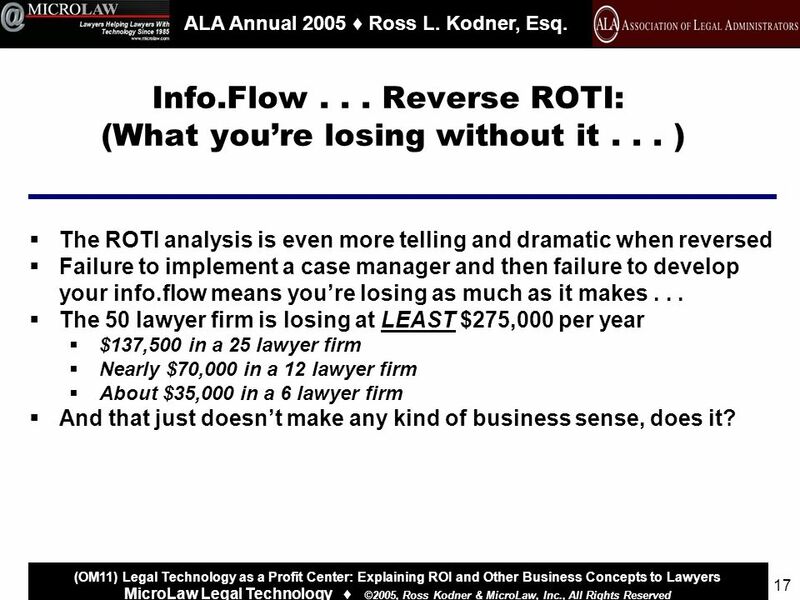 Reverse ROTI: (What youre losing without it... ) The ROTI analysis is even more telling and dramatic when reversed Failure to implement a case manager and then failure to develop your info.flow means youre losing as much as it makes... 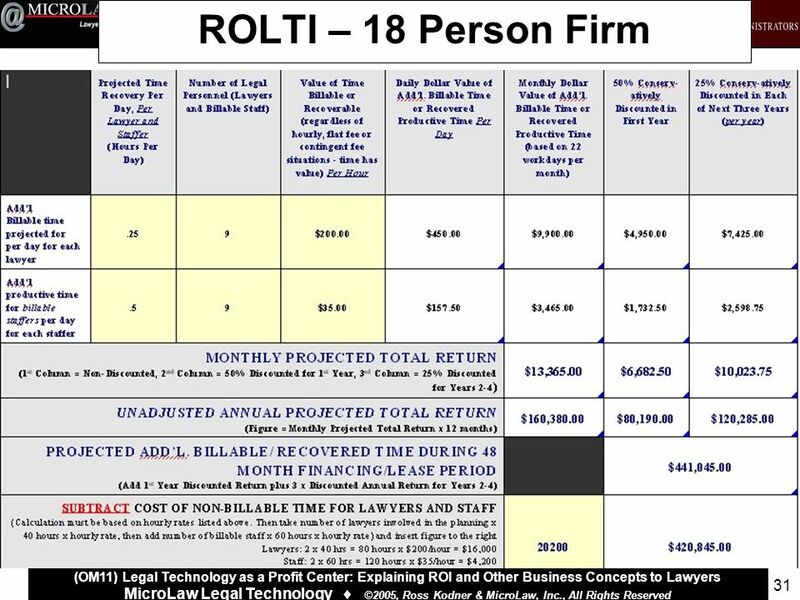 The 50 lawyer firm is losing at LEAST $275,000 per year $137,500 in a 25 lawyer firm Nearly $70,000 in a 12 lawyer firm About $35,000 in a 6 lawyer firm And that just doesnt make any kind of business sense, does it? 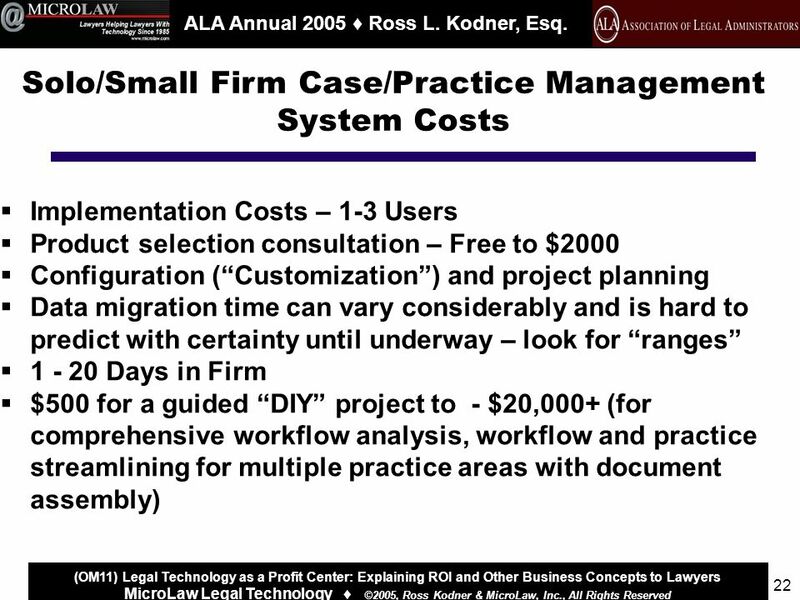 35 New York LegalTech February 2004 ALA Annual 2005 Ross L. Kodner, Esq. 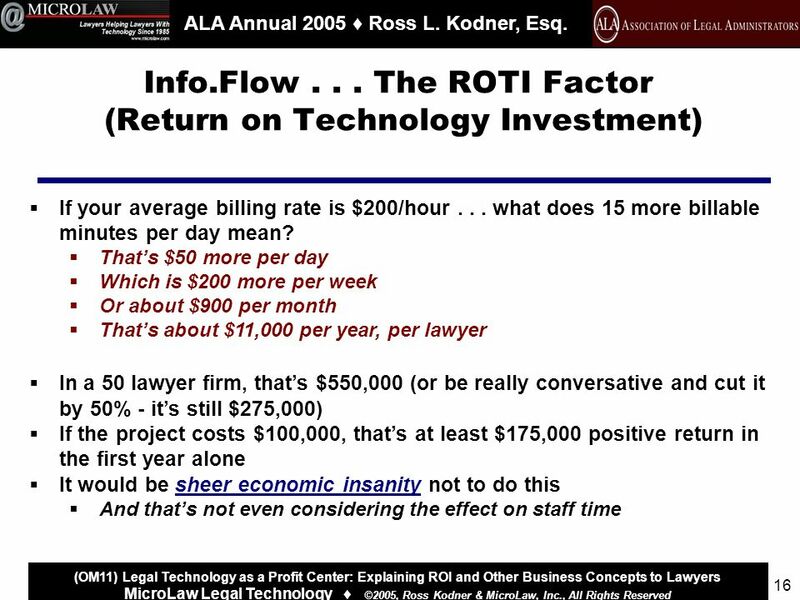 (OM11) Legal Technology as a Profit Center: Explaining ROI and Other Business Concepts to Lawyers MicroLaw Legal Technology ©2005, Ross Kodner & MicroLaw, Inc., All Rights Reserved 35 At the End of the Day -Technology Can Make More Money Than Any New Associate Steps to take NOW: Educate - Teach lawyers about the concepts of ROTI and especially, Reverse ROTI Understand that not making money because time is wasted that would otherwise be billable is the same as spending money Same negative net effect on the bottom line! Find the Holes - look at your practice -where is the time wasted? 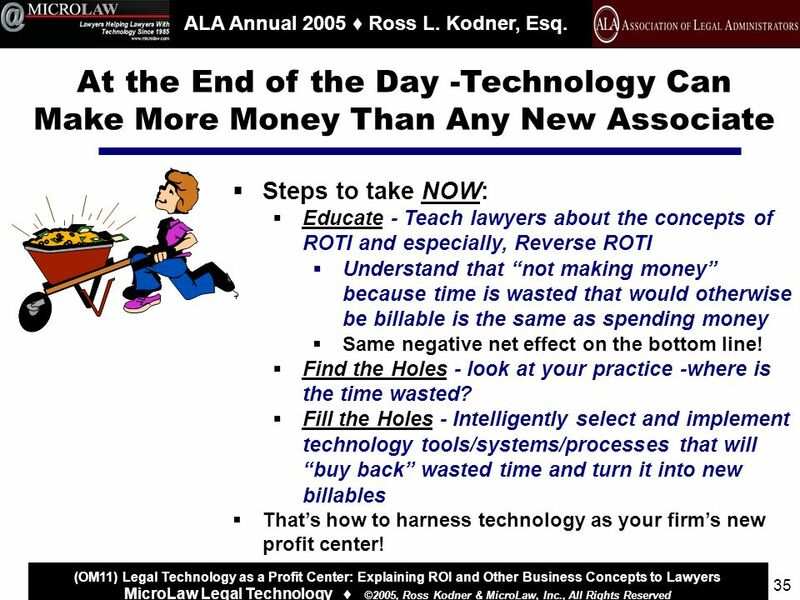 Fill the Holes - Intelligently select and implement technology tools/systems/processes that will buy back wasted time and turn it into new billables Thats how to harness technology as your firms new profit center! 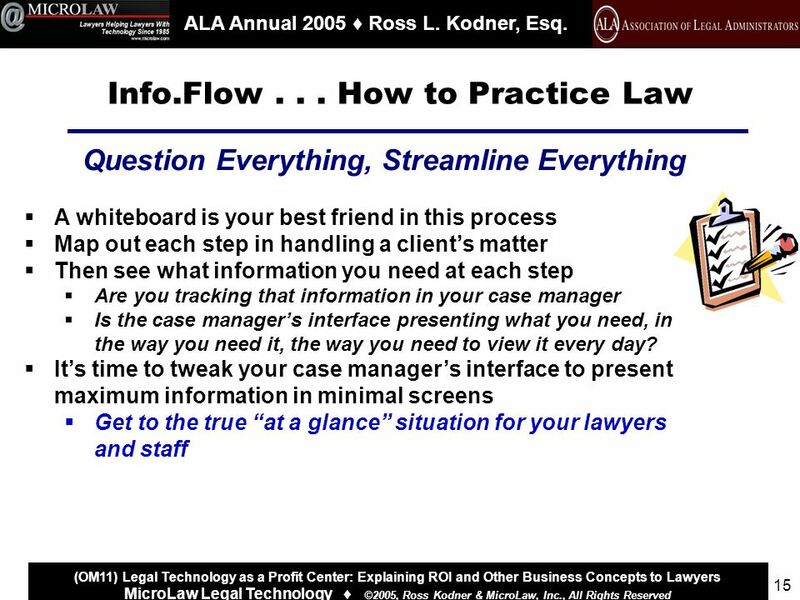 Download ppt "New York LegalTech February 2004 ALA Annual 2005 Ross L. Kodner, Esq. 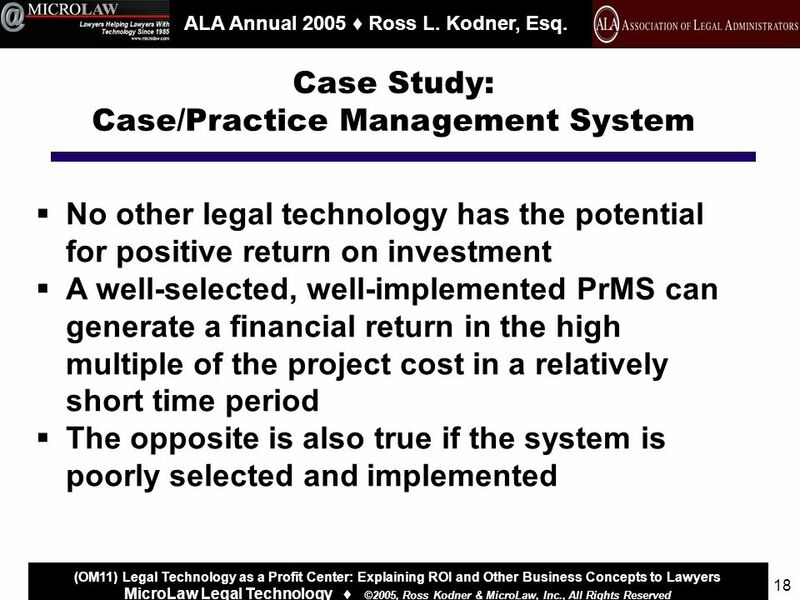 (OM11) Legal Technology as a Profit Center: Explaining ROI and Other Business Concepts."